Ghassan Salame making his latest brief to the UNSC from Tripoli (Photo: UNSMIL). 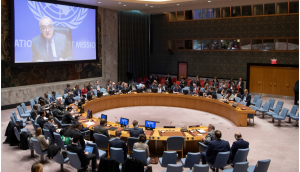 During his latest brief on Libya to the UN Security Council made via a video link from Tripoli yesterday, UNSMIL head Ghassan Salame said Haftar’s Libyan National Army (LNA) forces were generally perceived as a positive and stabilizing development in the south, but asked if the operation was sustainable. However, he criticised its mobilization further north which he said caused friction and counter-mobilizations which could lead inadvertently to conflict. He expressed concern about human rights violations in Derna. He confirmed that Hafter and Serraj had ‘‘met’’ in Abu Dhabi and confirmed Serraj’s version of their agreement that Libya will be a democratic state and its army would be under civilian control. Salame praised the Serraj government economic reforms but stressed that there needs to be more to save the Libyan economy and stressed the need for the forthcoming National Conference (Multaqa) to help Libya exit its transitional state and avoid force becoming the decisive factor in resolving its conflict.